The theme chosen for 2018 is Hyperconnected museums: New approaches, new publics. For the 5th year in a row, the mim Museum of Minerals teams up with the Ministry of Culture for a night ramble among the museums of Lebanon. Admire mimodactylus libanensi “mimo”, the fossil of a flying creature discovered in Lebanon, along with its breathtaking three dimensional reconstructions using the most advanced techniques. It is a new species and a new genus of pterosaur, a being that lived around 95 million years ago. collection of the Abi Saad family, Memory of Time is still ongoing for the third year. The theme chosen for 2017 is Museums and contested histories: Saying the unspeakable in museums. History is a vital tool for defining a given people's identity, and each of us defines ourselves through important and fundamental historic events. Contested histories are unfortunately not isolated traumatic events. These histories, which are often little known or misunderstood, resonate universally, as they concern and affect us all. For the 4th year in a row, the mim Museum of Minerals teams up with the Ministry of Culture for a night ramble in the museums of Lebanon. Mim invites you to discover the new section designed around the mimodactylus libanensis, the fossil of a flying creature discovered in Lebanon, along with its breathtaking three dimensional reconstructions using the most advanced techniques. It is a new species and a new genus of pterosaur, a being which lived around 95 million years ago. The FISH'N'STONE exhibition featuring a selection of the most beautiful fish fossils from the private collection of the Abi Saad family, Memory of Time is still ongoing for the second year. The theme of the 2016 event is Museums and Cultural Landscapes. A combination of both nature and history, a cultural landscape is a changing and constantly evolving territory, the product of a specific geological identity and transformations made by time and people. Both individuals and communities are responsible for protecting and enhancing these landscapes. For the 3rd year in a row, the mim Museum of Minerals teams up with the Ministry of Culture for a night ramble in the museums of Lebanon. 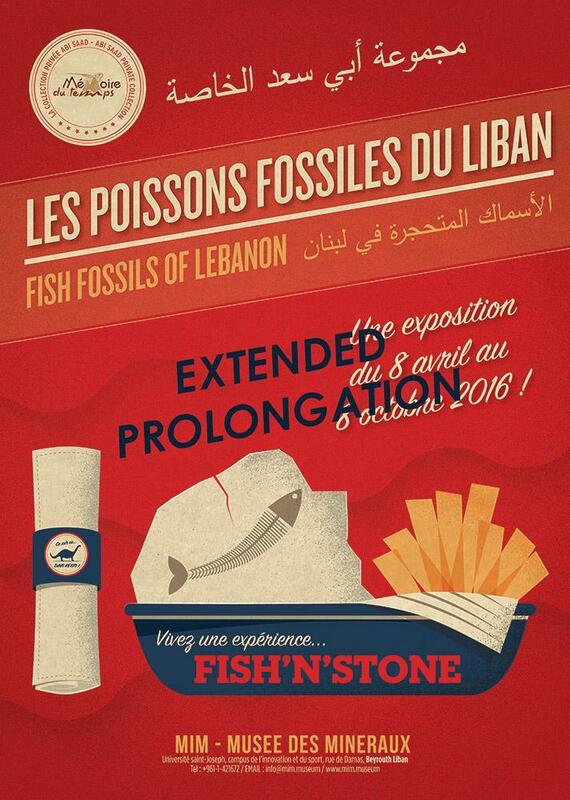 Don't miss the lauching of the FISH'N'STONE exhibition, with the collaboration of Mémoire du Temps. The theme Museums for a sustainable society recognizes the role of museums in raising public awareness about the need for a society that is less wasteful, more cooperative and uses resources in a way that respects living systems. Bringing museums to the forefront of this model of a sustainable society, the International Museum Day theme aims to foster awareness among the whole society about the current consequences of human action in our planet and the absolute necessity of changing its economic and social model. Discover the museums by night.